Blackheads consist of oily sebum. It is impossible to dissolve sebum with water. Not even soap will dissolve it. Oils can however dissolve it! - Steam your face to open up your pores or do it at the end of a hot bath. - Pour some oil of your choice (test several to find the best working one for you) into a cup and warm it "au-bain-Marie" (place the cup inside a pan of hot water), we need nicely warm oil. If you have a product with salicylic acid, add it to the oil. - Apply a lot of oil to your face and massage it in for 10-15 minutes or longer. - Wet a clean cloth with warm water and start wiping the oil off to loosen up the pore plugs that are now very soft. - If you are still too oily, clean the skin with a product that you normally use to clean your skin. - If your skin is very tough, you can use Scotch tape (wipe the oil off first) to pull the plugs out. Do it very gently. No abrupt movements with the tape. Do not use a tape if you are on Accutane or have very sensitive or thin skin. - Rinse your face with very cold water to close the pores. The best product to use for this method is an ointment with salicylic acid. Salicylic acid penetrates the pores. Make it liquid in the microwave but pour it into a cup first because any metal in a microwave causes fire and can damage the microwave. Salicylic acid is oil-soluble and it will add to the dissolving ability of the oil to unclog the pores. Such ointments are sold for psoriasis or callus foot heels. Oil cleansing method may cause breakouts in some individuals. You have to test it. Repeated use is necessary to fully unclog the pores and maintenance is necessary. If you clean your pores, they may slightly shrink in size. Salicylic acid is the best for acne and blackheads-prone skin because it has a comedolyitic (de-clogging) effect. It penetrates the pores and disrupts the sebum that plugs them. There is a popular myth that blackheads consist of dirt and they are caused by poor hygiene. Blackheads are in fact a mixture of sebum (oily substance produced by sebaceous glands inside the pore) and keratin (a tough, protective protein in the outer layer of the skin). The dark color of blackheads is due to accumulated melanin pigment deposition. Melanin is a pigment normally present in the skin, making up our skin color. The blackheads are only pigmented at the tip. You can use topical retinoids and do needling and dermarolling. Retinoids thin the epidermis but thicken the dermis (after long term use). The only problem is with Accutane taken orally. Accutane really thins the skin and it causes unpredictable healing. It is recommended not to have a laser treatment for at least one year after the Accutane treatment. You should also wait with other treatments like dermarolling, acid peels etc. Unless he has any concrete evidence for "microscarring" - and I have never seen this anywhere in the medical trials on microneedling - I'm assuming that he just doesn't like microneedling as competition for his much more expensive laser treatment. Also, I don't see how "microscarring" can cause any problems with the laser, and I wonder how he knows that "microscarring can cause problems with laser-treatment". Sounds like FUD to me. Dermarolling / Microneedling / Using Bio Oil after rolling? I went to their site and they do not give the percentages of their ingredients - the only relevant piece of info is how much vit. A it contains.. It contains twelve different fragrances however, and that makes me sceptical that this is a serious product instead of an expensive gimmick. Their website does not mention why the product would be good for stretchmarks, neither do they have any scientific backup that their product works. Their claims are unverifyable, as they do not allow you to read the actual "research" done on that product. That's a strong sign that they do not want you to read it. Why would a company pay many tens of thousands of dollars for a clinical trial, claim it was positive but not show you the test results as a downloadable PDF for example? In fact, if we have to believe them, they've done many clinical trials all around the world, which should have cost them at least a hundred thousand dollars. And they have nothing to show for it - not one downloadable test report. Clinical trials are extremely expensive. We paid 2500 dollars for a simple safety and purity test of our Lufenuron (and made it available for download). Clinical trials cost a small fortune, as it involves doctors following up on patients, in clinics, over many weeks or months. Unless it contains a comparable percentage of vit. A as vit. A ointments such as Infadolan, I'd say it's useless or even harmful. The ingredient list lists a dozen unneccessary chemicals (fragrances) of which nobody knows how they will influence the collagen induction process. The fact that a company puts so many nice smells into their product shows that they are not interested in its pharmacological properties but much more in its sales potential to the gullible mass market. In addition to that, they're clearly engaging in deceptive marketing practices, with obvious sponsored "awards" for the "best stretchmark product". Their "research" section shows nothing but fake research, using "research institutes" that lend credibility to their claims for a fee. The same with their agressive paid forum spamming and article writing by freelancers. You *never* should buy something that is agressively and expensively marketed, because such marketing is so expensive that there is no money left for high concentrations of active ingredients. You should also *never* buy anything that has a very long list of ingredients that are of no use, such as a dozen different fragrances. That is a clear sign that something's fishy. There are many thousands of products around that all cost nearly nothing to make and are marketed by an army of spammers and affiliates. Don't fall for them. There isn't a single magazine in the world that awards a price for the best "anti-stretchmark product" without charging a lot of money for such an "award". That's how those publications make their money. The same with "reviews". You get a review when you pay. And the "review" will always be positive. Stay with simple but proven products that come from a real pharmacy or real pharmaceutical company. Stay with products that are used in hospitals. The simplest is usually the best. Use products that are mentioned in medical research papers - not that "won prizes" in magazines. Yes you can use vodka but it's not optimal. It has a little too low alcohol content though. Perhaps you could add some isopropyl alcohol. The roller head has been reported to disintegrate on two occasions, when a very high percentage of Isopropyl had been used. As far as I remember, two customers claimed the dermaroller needles fell out and the sides fell apart as well. We never saw photographic evidence for this though, so it is hard to judge whether it was really the isopropyl that caused it, instead of a manufacturing flaw. One customer said they used 80% isopropyl in a dollar store and there was another customer with a similar experience. It might be that the isopropyl they bought had other additives such as ketones or even benzene which would dissolve some parts of the dermaroller but I'm not sure. They said they used 80% isopropyl alcohol. We have sold tens of thousands of rollers though, so this problem is exceedingly rare. They all do the same thing. You can buy them in various concentrations and they may vary by base ingredients and additives. The more is not the better concerning topical retinoids. High concentrations will irritate the skin. Do not apply too much. Mostly, a pea size amount is enough for the entire face. If retinoids make your skin red and flaky, reduce the amount and frequency of application. The skin will slowly get used to retinoids. Both tretinoin and tazarotene are also used to control acne but initially, acne may worsen before it gets better. You should dilute your 70% isopropyl alcohol with tap water and add some ethanol because I cannot guarantee your concentration will be harmless to the roller. Isopropyl is a solvent. So far only two customers complained about their dermaroller disintegrating in high concentration of isopropyl but I have to warn the customers. Soon, we will start selling our own disinfecting powder with which you can make the perfect disinfecting solution. If your mother and sister also have those white spots, it seems it is some kind of skin pigment disorder running in your family. Sun can cause white spots by destroying melanocytes (melanin-producing cells) but it is not very likely that all three of you have an issue with melanocytes getting destroyed by the sun. Do you have the spots also in areas that are hardly ever exposed to sun? Did you have them as a child? I could be a fungal infection of Tinea versicolor or a condition called Leukoderma etc. If we do not know the origin of the spots, I cannot tell if dermarolling can help. Maybe you should consider a visit to a dermatologist. Dermarolling / Microneedling / Frequency Confusion! "Our instructions say that a 1 mm dermaroller should not be used more than once in 10-14 days on the same skin area (this frequency is valid for the face. Thick skin on the body can be rolled more frequently). Our shortest dermaroller (0.25 mm) should be used at most every second day on the face." Yes, the frequency of twice a week applies to a 0.5 mm dermaroller. The frequency of a 1.5 mm is 3-4 weeks. Five is also OK. I get many emails with questions and sometimes I overlook a mistake. If you see factual or spelling mistakes in my postings, please let me know. 1. You will get results without any products. The products just help forming the ideal environment in the skin for skin regeneration. If you do not like A-Ret, do not use it. 2. Strange.. Vit. C crystals in water are almost odorless. I do not understand how the smell develops. It has never happened to me. Is your vit. C serum fresh? Put in a clean container? Yes, you can use it just for 5 days prior to needling. 3. No problem with using salicylic acid or anything else. The advice not to apply strong anti-inflammatory substances is only for immediately after dermarolling. Dermarolling / Microneedling / Can't wait to start - what do I order?? Just start with needling alone. If it doesn't work (you have to be patient though) you should attempt the melanocytes transfer. A-Ret is very useful for skin pigmentations but I am not sure if your skin can handle it after so many treatments and especially after the Accutane. However it is more useful for hyperpigmentation than hypopigmentation. Dermarolling does thicken the skin if used long term. Accutane helps in many cases of severe acne but unfortunately it thins the skin. It is advised to wait at least six months with laser treatment, dermarolling, facial surgery etc. because the thinned skin can result in unpredictable healing. Your skin is surely back to normal after 15 years. Melanocytes are normally at the bottom of the epidermis (0.1 - 0.3 mm depth). However a scar throughout the epidermis and dermis makes it difficult to restore normal epidermis again. Needling or dermarolling softens the scar and improves its color but it seldom goes totally back to normal skin. You may be lucky and your patches are just depigmented skin without scars. You can do both. 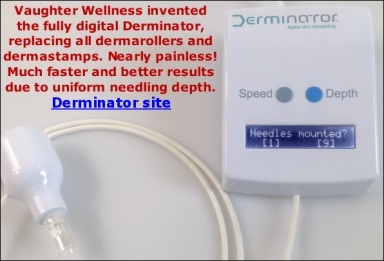 Needle the scar once in 4 weeks and use a 0.5 mm dermaroller (once or twice a week) in between the needling sessions. It is the same with every method. I get many emails with complains that some treatment - laser, peels, IPL, Thermage etc. did not work, or even made the condition worse or caused an additional problem (scars, hypo- or hyperpigmentation) etc. Unfortunately, there is no method that works for 100% of users for all possible skin conditions. After so many treatments and especially due to Accutane, it is likely that your skin has thinned.. The best would be to roll it everywhere with a 0.5 mm dermaroller. Hopefully, your hypopigmentation is just a lack of melanin pigment in the epidermis and not a scar in the dermis. If dermarolling doesn't make it better, start with the single needling. Dermarolling/needling often triggers or "wakes up" melanocytes and the hypopigmentation improves. You should needle the white patches and also needle a little over the edges of the white patch to facilitate the migration of melanocytes from the surrounding normal skin into the white patch. Dermarolling often triggers melanocytes (pigment producing cells) or "wakes up" existing dormant melanocytes. In some cases the color turns completely back to normal and in some cases the color improves but the scars remain still lighter than the surrounding skin. The extremely slow turnover of the cells in the dermis is the reason why a tattoo in the deep dermis (>1 mm) lasts a lifetime. Tattoos slightly lighten over the years but the pigment stays for dozens of years. Permanent make-up is not inserted so deep so it lasts long but not as long as a tattoo. Laser removal: The pigmentation laser targets the pigment. The pigment absorbs the light from the laser. This heats the pigment up and breaks it down. The heat from the laser can leave you with a scar and hypo- or hyperpigmentation by partially destroying the epidermis as collateral damage. You may never be able to get the color completely back to normal. Dermarolling or needling will very likely improve the color. You cannot reach the lower back with the single needle or a dermastamp. ..or a 1.5 mm narrow roller (three-liner).